Methodist College kicked-off the new year by recognizing the 2018 Outstanding Staff of the Year. Methodist College employees nominate colleagues who produce high quality work, assist others, preform beyond duties associated with their position, and create a positive work environment. Each year many high quality nominations are received for the award. This year the Outstanding Staff of the Year received multiple nominations. A committee comprised of past recipients selected Ms. Danielle McCoy, Director, Office of Access, Support, and Inclusion Services (OASIS) as the recipient of the 2018 Outstanding Staff of the Year! Danielle began her career at Methodist College as a grant coordinator for the Scholarships for Disadvantaged Students grant from Health Resources and Services Administration (HRSA). Danielle recently became the Director of OASIS, to further help assist students at Methodist College. 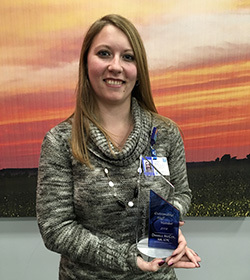 Danielle was nominated for the award for her work ethic, professionalism, organizational skills, and attention to detail. She is very involved in the campus community and always volunteers for committees to make a positive impact at Methodist College. She currently serves on the Values in Action committee. Danielle lives the mission and values of Methodist College on a daily basis. She always has a great attitude and looks for the positive in every situation. Every Friday afternoon she sends out a “thought of the week” email to inspire colleagues. Danielle is a valuable employee and we are fortunate to have her at Methodist College. 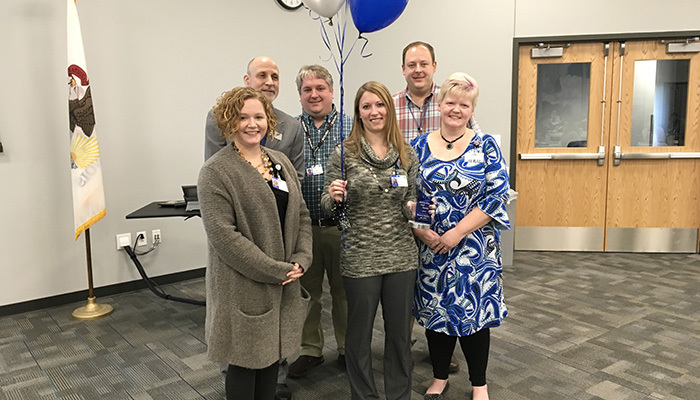 Also nominated for the Outstanding Staff of the Year were Mike Atteberry, Christy Cash, Karla Heussner, Michelle Nielsen Ott, Janet Ozuna, and Nancy Rebholz.